My friend Jenn organised it and our four went with her family and her sister's family. We spent lots and lots (and lots) of time in the water park…. I mean about 80% of our time. There were pools, slides, rides and 'hot tubs'. My little ladies also got their first manicures… They loved the pampering and now when A sees my nails painted, she asks if I went to 'scoops' (the name of the place). They also loved the story times, the arcade and all the Magic Quest fun. Jenn and her family are experts in this place so they made sure to take us around to see everything! We just went for one night but then stayed the next day until story-time… you're allowed to use their facilities until 9 pm after you check out. My two crashed almost instantly. The rest of March break was mostly local and pretty low key! Lots of library programs including a puppet show and a magician. We also had my nephew for his very own parent-free sleep over and celebrated St Patty's Day with the kids, wings, green beer and apple juice. And now we have a long weekend coming up. Hopefully, it's nice and low key and there are no major calamities to report. Yikes on the accidental almost flooding! That place looks great- we're doing Niagara this summer so I'll have to add it to my list. I have always wanted to try one of these places but have yet to pool the trigger. Dude, sounds like your week has been crazy!!! We've only ever been for a wedding reception. I really want to go and stay! I have heard such great things about Great Wolf! Ill have to investigate and see if theres one close by. Wow! Talk about excitement I hope everything turned out ok! Ooh, we have a Great Wolf Lodge about an hour from our house and I've been thinking it'd be fun for the kids ... so cute! What a fun trip! 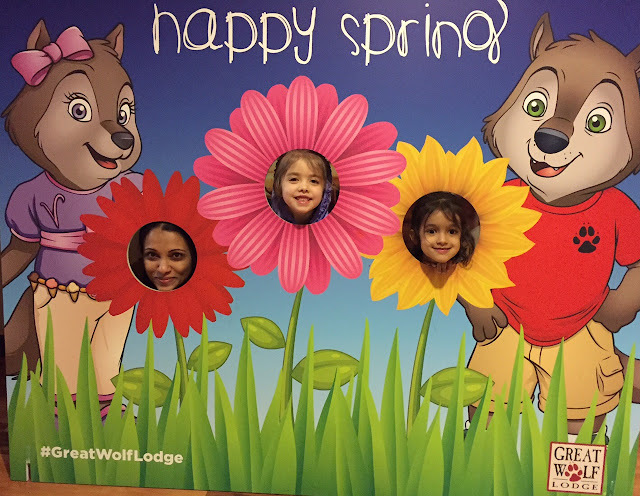 We have a Great Wolf Lodge close by - when Mila gets a little older, I think we may need to visit! We've been talking about going to Niagara Falls this summer, but I'm not sure we'll make it. Definitely on my bucket list though. Oh no to the flooded toilet and accidental bangs!